CLICK HERE TO CONTACT US Compressed air is introduced into an air bearing system in one of two ways:1.If the air bearing is part of a manually operated system, (no remote control unit) then each load module will contain an air flow control valve on one of its edges. 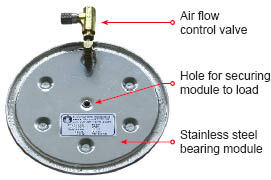 This air flow control valve can be used to control an individual air bearing by increasing or decreasing the amount of air being applied to the bearing.2.If the air bearing is being used as part of a remote controlled system, the load module will have an air inlet port on one of its edges. This port accepts an air supply hose, fitted with quick disconnects, which runs to an air outlet port from the remote control unit. Air flow control to the bearing is controlled from the remote control unit.